Meet Inada Daigo, a 17-year-old newbie just assigned to this island. His strong sense of justice makes him pick a fight with the mafia ruling over the northern region, where he was assigned to, on his first day. Now he will carve his name in Island No. 5's history as the strongest rookie policeman ever. Daigo Tokusou began in issue 33 of Weekly Shonen Magazine by Enji Tetsuta. With this new series Tetsuta will have two series running simultaneously. His other work, Gumi from Vocaloid, which he works in collaboration with the internet author Kabushiki Kaisha, runs in Shonen Rival. Daigo Tokusou is Tetsuta's first work as a solo mangaka. The premise of the story is very interesting with decent artwork to fit it. 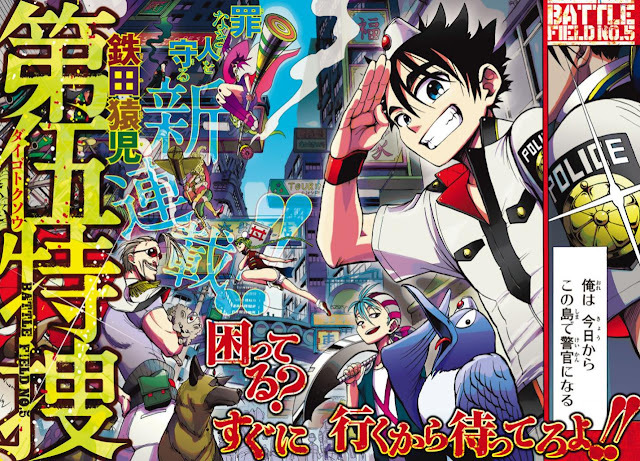 Overall this series should do well in Weekly Shonen Magazine. I agree, it looks like a very promising series. It really depends on the translation groups, but I hope they do choose to do it.